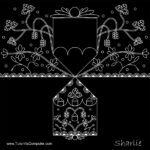 Zentangles® are a form of abstract art that consists of patterns, called tangles, and was popularized by Rick Roberts and Maria Thomas. 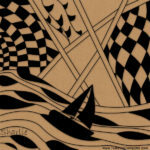 You can learn more about Rick and Maria by visiting zentangle.com. 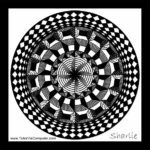 My name is Sharlie. 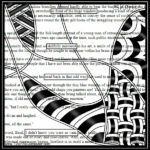 These pages display artwork of mine that incorporates tangles and/or uses other forms of art. Joey’s Weekly Challenge #201 The Challenge: Tangle in a string. Use string number 157 and the tangle Drogon. Joey’s Weekly Challenge #197 The Challenge: Start by dividing the tile or page in half either vertically or horizontally. Then draw the string on both sides of the line. Tangle inside the string on one side and outside of the string on the other. 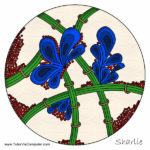 The tangles are up to you. .
Joey’s Weekly Challenge #216 The Challenge: Finish my tile. 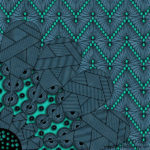 Start with the pattern Friendship. Make it front and center. Joey’s Weekly Challenge #219 The Challenge: Finish my tile. Start with the pattern Poke Root. Make it front and center. 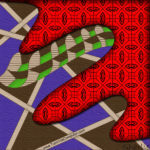 Joey’s Weekly Tangle Challenge #222 The Challenge: Finish my tile. Start with the pattern Maryhill. Make it front and center. 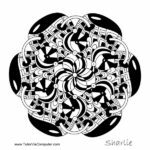 Maryhill begged to be a mandala, so I obliged. 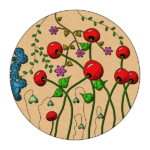 The outer ring represents real growth for me as an artist. I have never been able to successfully achieve the effect before.